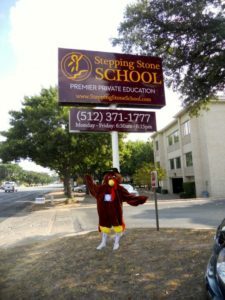 The students of Stepping Stone School at Shoal Creek competed in yesterday’s cool morning to determine which of them was the Turkey Calling Champion. The Turkey Call is a contest among some of our 4- and 5-year-old children to see who can elicit a response from a turkey. The students each have their own unique turkey impressions, making this a highly entertaining event. 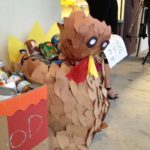 This year’s contest featured a new jake turkey who seemed to enjoy the children’s attention, rewarding their efforts with some gobbles of his own! The children of Stepping Stone School made festive turkey hats and sang turkey songs as well. They also were excited by the presence of television cameras. See a news clip from KVUE here and one of our clips on Facebook. The families of Stepping Stone School also collected nonperishable food for Caritas of Austin, a non-profit organization that fights hunger, homelessness and poverty. The Turkey Call is an annual event to encourage registration for the 23rd annual ThunderCloud Subs Turkey Trot and Stepping Stone School Kids’ K, which will take place Thanksgiving morning. All proceeds from the Turkey Trot benefit Caritas of Austin.